Sportsbetting.ag is a longstanding Sportsbetting, racebook, casino and poker room. They are apart of the BetOnline family and a skin on the Revolution Network. Sportsbetting.ag is a licensed and regulated company. So you can feel relatively safe about playing poker for real money at their site. Sportsbetting.ag accepts real money poker players from all over the world. That includes American players. Even those in states like Washington or Maryland that other poker sites don't allow. Setting up a real money account at Sportsbetting.ag is simple to do. 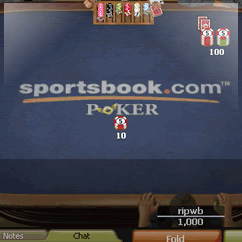 Simply choose the Sportsbetting Poker download that works with your PC or opt for the Mac poker download. There is no standalone mobile download, nor is their poker client mobile-friendly (it is for sports-betting though). Next, run through the setup wizard and create your account. The entire process will take 5 to 10 minutes to complete. Sportsbetting.ag's deposit limits range from $50 to $25,000. There is no maximum limit for bankwires and book to book banking. The withdrawal limits range from $100 to $8,000. Keep in mind that the banking options available to you will depend on where you live. Sportsbetting.ag What Kinds of Poker Bonus and Rewards Are Available? 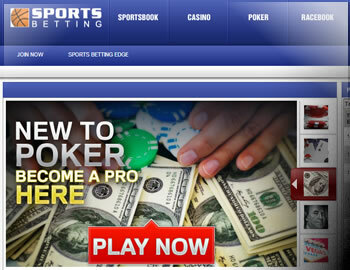 Sportsbetting.ag has several ongoing promotions for poker players. Lets look at a couple of them. 25% Deposit Bonus for Life - The first promotion you'll want to take Sportsbetting.ag up on is their 25% Deposit Bonus for Life. This is a free bankroll bonus that rewards you with a 15-25% match on each deposit you make. The match you receive will depend on which deposit method you use. The maximum bonus amount you can receive each deposit is $900. There is a 6x rollover on each bonus. You'll want to complete the rollover requirements before requesting a withdrawal, otherwise you run the risk of having your bonus and earnings taken away. Other Promotions - Here is a brief overview of the other promotions that Sportsbetting.ag offers. Guaranteed Tournaments - Sportsbetting.ag guarantees $150,000 every month in tournaments. Hit and Run Freerolls - These are daily freerolls. The cool part is that there are re-buys and add-ons available. POP (Player Option) Points - Earn 1 POP point for every $.10 in rake spent. You can buy into a $500 tournament every Friday (5pm EST) for 100 points. Daily freerolls run too. What Poker Games Can You Play at Sportsbetting.ag? Poker isn't Sportsbetting.ag's primary focus. Sports betting is. That said, recreational players will still find a good variety of games running around the clock. For cash games, the options are holdem or omaha. The stakes for holdem start at 2nl and cap out at 1000nl. When I checked the games out most of the tables running were at the microstakes, but there were a few at the higher stakes too. The stakes for omaha run from 10nl to 300nl. There were a few games running when I last looked. Nothing compared to the holdem tables, though. For tournaments and sit n go's, the only option is holdem. Stakes range from free to $40 for tournaments and .05 to $500 for sit n go's. Variations include 6-max, heads-up, multi-table, turbos, step and satellites. Most of the sit n go games running were at the microstakes. From the lobby you can also access the horses, Sportsbetting and casino. Keep in mind that you may have to download additional software or games to play in the casino. You can also make money transfers from one client (poker) to another (Sportsbetting or casino). I did contact live chat while reviewing their site. I needed to ask about their US acceptance policy (if they excluded sites like Washington or Maryland) and if they had a Mac specific download. I waited about 2 minutes to be helped, and my questions were answered in less than 5 minutes. The operator was friendly and knowledgeable. I had a good experience. Sportsbetting.ag also has a large FAQs page that can answer the most common question that you may have.